Beef is a great option for any paleo dinner, and this paleo beef stew will fill you up without taking all night to make, thanks to the Instant Pot! Beef is a high protein food (3 oz of broiled ground beef contain 22 gm of protein) and is an excellent source of many vitamins and minerals. 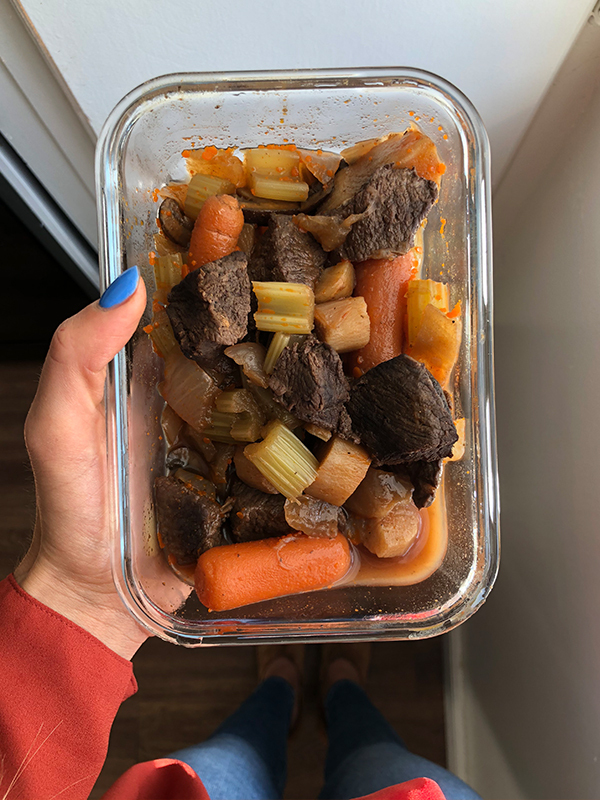 Because of the neverending debate about eating beef, you may be wondering why I chose a recipe for paleo beef stew, rather than something with chicken. Beef can be included as part of a healthy diet, especially if you’re choosing higher quality meat. That being said, let’s talk about the differences between grass-fed and grain-fed beef. Almost all cows are born drinking milk and, very soon after, eating grass. Eventually, those destined to make up the grain-fed group will be transitioned to a diet primarily based on grain products like corn and soybeans. This diet helps them get bigger, fatter and ready for market faster – an important factor in the high demand for beef in America. In comparison, grass-fed cows remain on the more natural diet of grass and hay. Their diets may include some grains, but it’s more of a dessert than an entree. Just like us, cows need their greens to stay healthy! Grass-fed cows tend to be leaner than grain-fed, meaning they have less total fat and so their meat is lower in calories. They also boast a higher omega-3 content than grain-fed cows. Omega-3 fatty acids are known for their anti-inflammatory properties, which promote heart health. Fish like salmon and tuna are still much better sources of omega-3s than beef, but choosing grass- over grain-fed beef will still benefit your total intake. For an even leaner choice, considering trying out bison meat. Typically, bison are grain-fed throughout their lives and have all the same benefits as grass-fed beef in larger amounts. Their meat is leaner still, and like beef contains high amounts of omega-3s, iron, and vitamin B12. By using grass-fed beef or bison in this paleo beef stew, you’ll have a meal that is lower in calories and fat, and higher in omega-3s and other vitamins than if you’d used conventional grain-fed beef. Inspired by: The Domestic Man. Hit the sauté button on the Instant Pot, sauté grass-fed beef with 1 tbsp ghee butter and fit flavor spices. Cook until browned (You may need to do it in 2 batches). Add the onion, garlic, 1 tbsp ghee butter and tomato paste. Cook until onions are translucent. Add the wine and beef broth, bring to a simmer. Add the beef, carrots, parsnips, celery, mushrooms, and thyme. Put the lid on the Instant Pot and set to Meat/Stew for 20 minutes. Let the Instant Pot depressurize naturally & add more salt & pepper!